We love our sportsmen and active gnomes at GardenFun. We offer several gnomes enjoying various types of sport, including our Golfing Garden Gnome. Standing 15 inches tall and made of cast stone resin to hold up in any weather, this golf lawn gnome has a sophisticated sense of style. This golf gnome is impeccably dressed in a tunic and vest and stands posed with his golf club and ball. Thoughtful and expressive, our golfing garden gnomes will be a huge hit in your yard and deeply appreciated as a special gift for a golfing aficionado. 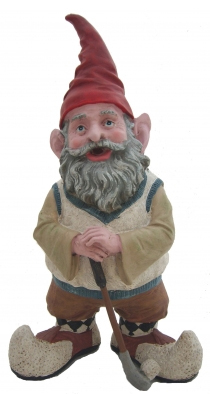 Why settle for plastic garden gnomes when you can have premium-quality cast stone instead? Not only do we have golf gnomes; we also offer gnomes as fishermen, soccer players, baseball players and even varsity football players.